Sanibel waterfront homes and properties are found right here. Preview your next Sanibel waterfront home or property by clicking on a geo zone, list price range, or neighborhood hotlink on the right side of this page. Sanibel waterfront real estate is rare and wonderful paradise island living. The unique natural beauty of Sanibel Island is due in part to the islands being classified by the state and federal governments as sanctuary islands. People who love Sanibel work diligently to ensure the islands are not over-developed thereby protecting the many natural resources including pristine beaches, mangrove forests, fishing, birding, shelling, and other wildlife. 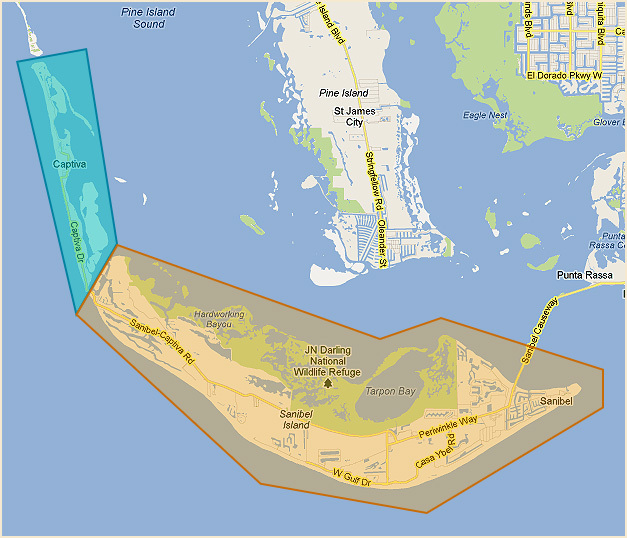 Gulf access Sanibel real estate includes gulf frontage, bay, and canal properties. Captiva waterfront homes and properties are in limited supply but easy to find here. Search and find your Captiva waterfront home or property here at waterfrontauthority.com by choosing one of our quick links sorted by geo area, price range, or neighborhood. The beaches of Captiva and surrounding fishing opportunities in the Gulf of Mexico, Redfish Pass, Blind Pass, and Pine Island Sound are second to none. South Seas Island Resort is a world famous destination and occupies the entire north end of Captiva Island. Captiva waterfront real estate opportunities include direct gulf frontage homes, bay front homes, gulf to bay homes, and Roosevelt Channel. Click here to receive automated email notifications for new listings! When buying or selling waterfront property, most buyers and sellers begin their search online. At WaterfrontAuthority.com, we have gone to great lengths to make your waterfront search easy. Choosing a REALTOR® with in-depth local waterfront experience and expertise to be your personal guide will be your most important decision. The REALTOR® you choose will be the resource that helps you identify opportunities and avoid pitfalls. If you find WaterfrontAuthority.com to be a helpful and valuable resource for your waterfront needs, contact Trae Zipperer, the Waterfront Authority® and learn how he can take your waterfront knowledge to the highest level of understanding.